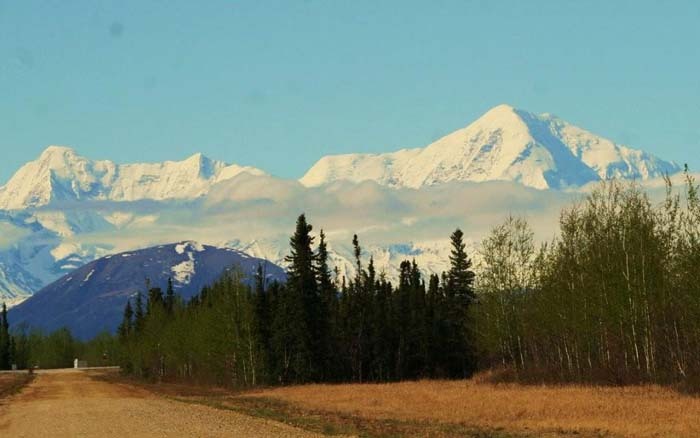 Take a drive south on the Richardson Highway about 23 miles from Delta to get to the vicinity of Donnelly Dome. It’s a popular climbing adventure – the top is about 2,400 feet above actual ground level. Though steep, the hike is not difficult. Take your time and enjoy the view. Bring binoculars. You should take a windproof jacket and perhaps a sweater, depending on the day, as it is often quite cold and windy toward the top. Allow half a day for this trip. At Mile 248, take the gravel road to the right (west) of the highway, drive past the second sharp bend for 300 yards and park in the pull-off on the left. A fairly well-worn but unmarked trail leaves the pull-out in the direction of the north ridge of the Dome. The trail first goes through alder and willow. As you get higher, you are above the brush. 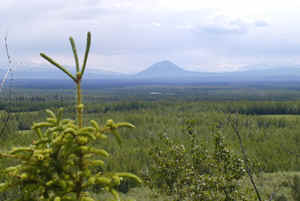 The view is excellent, both of the Tanana Valley and of the Alaska Range. As you gain elevation, you will see flowers in different stages of development – toward the top, July is spring! All recreational users on Fort Wainwright, Fort Greely lands, 16 years of age or older must register for the Recreation Access Permit (RAP) and sign in to the USARTRAK system before recreating. This is free of charge and open to everyone. Since the area around Donnelly Dome is military owned, you will have to sign into Usartrak and obtain a pass. It is very simple to complete. Behind Donnelly Dome, Pipeline Mile 560–When I bump off the mosquitoes, the front screen of the tent provides a clear view of a favorite Richardson Highway landmark–Donnelly Dome. I camped near the Donnelly Dome reflection pond to get acquainted with the mountain, which from here looks like a 3,910-foot loaf of stone with green stubble on the bottom third. Standing alone in the Delta River Valley 18 miles south of Delta Junction, Donnelly Dome always sparks a few questions by those who drive past; I’ve heard people muse over whether the Dome is a lonely volcano. Before I took my dog for this long walk, I called Tom Buntzen to find out the facts about Donnelly Dome. Buntzen is a state geologist with the Alaska Division of Geological and Geophysical Surveys. Donnelly Dome is a bit odd, he said. In fact, it shouldn’t even be here. “It is out of place,” he said. “A glacier went down the (Delta River) valley. It should have sheared Donnelly Dome off, but it didn’t. Buntzen has climbed to the top of the dome and has seen evidence that glaciers touched it, even if they didn’t shave it from the valley floor. Buick-sized “erratics,” rocks that came from somewhere else, sit on top of the dome. How did the dome resist being scraped from the earth while those around it crumbled under the force of an Alaska Range glacier that covered the area 70,000 to 100,000 years ago? 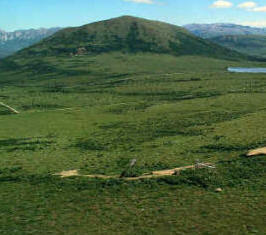 Buntzen said Donnelly Dome may have had the luck to squeeze between two separate tongues of the glacier. I’m glad. Someday I’ll climb my favorite fleigberg. But not today, I’m too tired. This column is provided as a public service by the Geophysical Institute, University of Alaska Fairbanks, in cooperation with the UAF research community. Ned Rozell, a science writer at the institute, is hiked the trans-Alaska pipeline this particular summer to commemorate the 20th anniversary of the Alaska Science Forum and the pipeline. The pipeline started pumping oil on June 20, 1977 and to present.